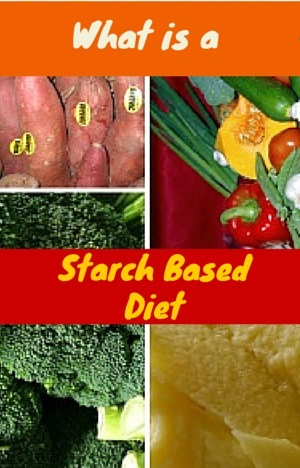 A Starch based diet is a diet based on starches like potatoes, sweet potatoes, rice, couscous , quinoa, barley, corn. It is mainly based on potatoes and grains. You may also know it as a whole food plant based diet. Besides starches we eat lost of vegetables, like lots of greens and other non starchy vegetables. You can eat the vegetables cooked or raw. It depends on your taste. I sometimes eat lost of salads and sometimes I Prefer cooked vegetables. We also eat lots of legumes, beans, chick peas, lentils. Soups, stews, curries, and just plan baked vegetables are the staple of our diet. Another staple is oats. I personally love oats, so much that I can over eat them. Many people confuse this diet with a vegan diet. This is not a vegan diet. Well, it may look very similar, but there are some differences. You can follow a vegan diet and still be overweight and unhealthy. Chips are vegan, but they are not good because they are fried in oil. Some cookies are vegan, but that does not mean they are healthy. Vegan is also a philosophy of life. Vegans do not eat animal products because of ethical reasons. They also do not wear any leather products or wear anything that has animal products like make ups. I started this diet because of health reasons, but with time I also cared about animals. I do not go out of my way to buy animal based products like leather, but if I already own them, I still wear them. I rarely wear makeup, not because of animal products ,but because I always worn very little makeup and these days I wear even less. My website starches and greens is where I share my experiences with this diet, and also some appliances reviews. I saw followers of this diet ask about which appliance is best or not. Because I love papacies and because I am quite technical I decided to do some reviews of appliances. I also post about my recipes, that I do or someone else’s recipe which I try by myself. If you want to follow me, please be sure to sign up for my free report. Ingredients you need for this way of eating.